Onnea matkaan – good luck! Continue your Finnish language studies with VocApp’s flashcards! Get ready to improve your Finnish vocabulary and to familiarize yourself with the basics of the Finnish grammar! With VocApp’s "Finnish: day two" -course, you will continue your Finnish language studies, and learn and memorize more and more useful words and phrases to use in everyday life. With this lesson, you will learn as numbers in Finnish, a variety of adjectives, and useful phrases – among some other things! 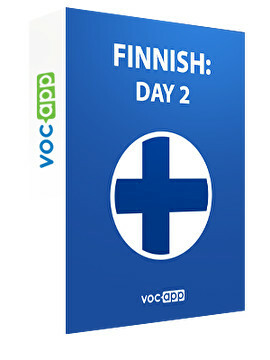 VocApp’s "Finnish: day two" will also introduce you to the basics of the Finnish grammar. You will be taught some of the most crucial rules, which will help you to start forming sentences in Finnish. Example sentences will help you remember and understand the grammar even more effectively! Fed up with language learning apps that are exhausting or do not give you the results you hoped for? Haven’t found a Finnish language lesson that would feel right for you? Don’t worry - VocApp provides you with the best way to learn Finnish. Our learning methods are proved to be effective and to provide positive results. The study methods are based on multi-sensory learning – for example, pictures for visual learning, and recordings of the word for learning by listening – which is more effective than traditional language courses. , VocApp’s language courses will prepare you for communicating with Finnish people in their native language! With VocApp, you will not only broaden your vocabulary, but also gain more and more confidence the more you learn. Learn Finnish regularly to get the best possible results – with VocApp, you can set notifications at your chosen time to remind you about studying. Only 5 minutes per day will help you learn a language! Study wherever you are on your mobile device or computer – at home, while commuting to work or school… Learning Finnish has never been so easy and entertaining. Are you ready to learn more vocabulary and some Finnish grammar?